The Apostles had to leave everything behind to follow Christ. You can follow Him, while remaining in your own home! How? God may be calling you to the Secular Institute Servitium Christi (for single women and widows). 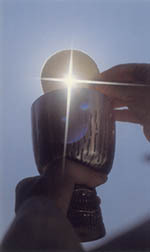 Spirituality: The Eucharist; Commitment: vows of Poverty, Chastity and Obedience. Why? To love Him and to bring Him to others. A Secular Institute is a recognised way of living the Consecrated Life (i.e. with the three Vows) but yet remaining in a secular setting rather than in a religious community setting. The spirituality of the Secular Institute Servitium Christi is the Eucharistic Spirituality of St Peter Julian Eymard (1811-1868). Our Institute was founded in the Hague, Holland, in 1952, by Fr. Godfried Spiekman SSS, then Superior General of the Congregation of the Blessed Sacrament, in collabroation with Miss Ton Golsteijn and Miss Han Bollen. We now have members in such far-flung places as Holland, Brazil, Chile, Vietnam, The Philippines, Australia, USA, Italy, Czech Republic, Germany and of course in Britain and Ireland. We strive to make Jesus in the Eucharist the centre of our lives, drawing strength from our daily celebration of the Eucharist, and an hour of prayer in the Presence of the Blessed Sacrament. Each member lives her everyday life wherever she finds herself: in her own home, with her family, sharing with friends. We strive to bring the values of the Eucharistic Presence to those with whom we work and live.